Summon your wind-up Minfilia minion. 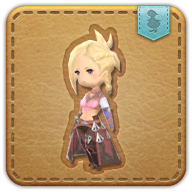 Unlike the real Minfilia, this one actually accompanies you on your adventures. This clockwork automaton has been crafted at the behest of the Adventurers' Guild in celebration of the Rising, Eorzea's annual celebration of rebirth. All linkshell privileges have been revoked so one not need dread incessant calls throughout the small hours of night.